The following blog post is written by Flipgrid Educator Innovation Leads Jornea Erwin, Ann Kozma, and Jess Boyce. Fliphunts are an engaging way to get your students moving and having fun as they explore your curriculum. We recently caught up with Kathi Kersznowski, an amazing tech coach, MIEExpert, and the original creator of the #Fliphunt. Check out this Q & A as she shares all the things you need to know to create and use a #Fliphunt in your learning community! Q What is a #Fliphunt? A #Fliphunt is a digital scavenger hunt that takes place on Flipgrid. You create the Tasks to engage your students and challenge them to show what they know with video Responses. I had a “Flipiphany” and realized that the idea of using Flipgrid as a formative assessment was a fun and meaningful way to check for understanding. I started calling these learning scavenger hunts Fliphunts. Q How can I use a #Fliphunt in class? Focus on an objective or your subject matter. Ask yourself what you want your students to know and how could you gamify it to make it fun? Connect your content and objectives to a Fliphunt “task” and let your students show what they know by giving them the opportunity to be creative with their Flipgrid Responses. Start with your curricular objectives and build tasks around that. Then create a document (Word or Google) that you will add as a Topic Attachment. 90% of the work is in creating that #Fliphunt doc! Always add in some silliness - Fliphunts are meant to be fun - by adding action verbs to your prompts. If you can think of ways to take it outside your classroom, that’s even better. The movement needs to be creative and varied to keep interest. Act it out...use the pause button...add props…act like a TV reporter…give it an action...don’t repeat the same task, it’s a video after all! Q Do you set up a #Fliphunt as one Grid or as different Topics? You get to decide! It can work as an entire Grid or as different Topics on a Grid. Either way, I would encourage participants to use the Title feature to write the name of the task they are responding to. That way, everyone sees all the Responses that have been added to the #Fliphunt. It’s helpful to have the Title featured prominently to let others know exactly which task or challenge is featured in the video! I also love to go back and make responses look extra special by topping them with a Vibe as a title. There really is no right answer to this question, but I prefer to set up one Flipgrid just for Fliphunts. Then, as time goes on, all of your Fliphunts (each one is a different Topic) and all of the linked Docs will always be in one place. For me, it’s organizationally convenient. Q What pro-tips do you have for teachers? 🎯Have fun making the task document - I like to use Checkboxes, but I’ve seen folks use point values or assign “levels” for the tasks. If you want to differentiate your directions, use different text colors to indicate the degree of difficulty. 🎯Although you have a digital doc linked to the topic, it may be easier for participants if they have a paper copy. You may want to print it out! 🎯The most common question is: Do “players” make one long vid of all their responses and just use the pause button, or should each be a separate video post? There’s no right way, but my recommendation is usually the latter because I value the opportunity for the community to add feedback on each one. 🎯Be mindful of the time! Set your Video Response Length to 30 seconds MAX! 🎯Remember, Fliphunts are not just for students! You can make a #Fliphunt for anything from family events, club activities, and teacher team building fun. 🎯Add your own ideas to this collaborative, crowd-sourced #Fliphunt Grid or find new ones to use in your classroom. I hope you have fun engaging your community with a #Fliphunt! The following blog post is written by Flipgrid Educator Innovation Leads Jornea Erwin, Ann Kozma, and Jess Boyce. In the #GridTip Series, Jornea, Ann, and Jess will share tips and tricks to help you explore ideas and possibilities with Flipgrid. Every day is a great day to read! We love that teachers and students celebrate literacy and participate in epic collaborations like Read Across America Week and #WorldReadAloudDay. Whether your students are participating in a special event, reading at school or home, or enjoying a favorite book for the tenth time, here are some ways they can share their love of literacy on Flipgrid, 365 days of the year! 🐉📖🐉 Bring the magic of literature to life with Cressida Cowell, author and illustrator of the How to Train Your Dragon series! Register for the March 6th Skype experience and prepare your students with these ✨exclusive✨ ready to launch Flipgrid Disco Library topics. 🔎📖🔍 As your students explore literature, have them share their authentic reading lives with others. They can share a BookTalk, make book recommendations, connect text with Booksnaps, go Book Speed Dating, or participate in a March Madness Book Challenge! 🎟📖🎟 Share a reading experience with your favorite authors and invite them into your classroom for an extra special book connection via Guest Mode! Looking for inspiration? Check out Miss Nikki's Author Connection Grid or Connect with Authors and Storytellers to see which authors may be interested in participating. 📣📖📣 Amplify the love of reading by sharing with families. Read together on a Grid, discuss favorite books, or share book recommendations with others. 👭📖👬 Connect with incredible librarians like Andy Plemmons, Deb Zeman, Shannon Miller and Kristina Holzweiss. Librarian leaders bring the magic of reading to your school and are ready to share ideas, experiences, and best practices for celebrating literacy all year long. Ready to get started? Just create a Flipgrid Topic for your learners. They will be sharing their love of reading in no time! If you’re not sure where to start, give us a shout. We are always here to help! Once you’re ready to create your first Professional Development discussion Topic, you can dive right in from your Educator Admin or head to the Disco Library for inspiration. Here is a sampling of Professional Development topics currently available in the Disco Library, all created by your peers and ready to be used with your community! Workshop Reflection by Kim Lowden: A Topic encouraging educators to reflect on learning experiences after professional learning to inform the facilitator’s next steps. STEAM Parking Lot by Dana Woods: A Topic to activate learning and develop a shared understanding of content. The SAMR Model by Lesley Burdine: A Topic that engages participants in learning about a model that support best practices in technology integration. Flipgrid Resource by Evelina Despaigne: A Topic to use after professional development to engage educators in sharing ideas for implementation based upon their learning. Collaboration by Wayne Haskovec: A Topic inspiring educators to continue learning socially by creating networks beyond their school and district. Favorite Technology Tools by Nicole Kempson: A Topic that helps build a resource bank of tools for educators to use as solutions for learning needs. Meet, Greet, and Discover #FlipHunt by Jen Giffen: A Topic for educators to learn through discovery using a fun scavenger hunt. Screencasting Annotations by Ben Kelly: A Topic showcasing a step by step demonstration of a specific task or ways to implement an idea. Ask Your Coach by Tamika Durrah: A topic to ask questions and receive support from a coach anytime and anywhere. Learner Environments Today by Beth Clarke: A topic that engages participants in aligning and defending their thoughts to a sketchnote representing a learner-centered classroom. Learner 1 - Educators continually improve their practice by learning from and with others and exploring proven and promising practices that leverage technology to improve student learning. 1a: Set professional learning goals to explore and apply pedagogical approaches made possible by technology and reflect on their effectiveness. Collaborator 4 - Educators dedicate time to collaborate with both colleagues and students to improve practice, discover and share resources and ideas, and solve problems. 4C: Use collaborative tools to expand students’ authentic, real-world learning experiences by engaging virtually with experts, teams and students, locally and globally. Facilitator 6 - Educators facilitate learning with technology to support student achievement of the ISTE Standards for Students. 6D: Model and nurture creativity and creative expression to communicate ideas, knowledge, or connections. 💥Join the #FlipgridFever educator community on Twitter and Facebook! Follow educators like Holly Clark, Kathi Kersznowski, Brian Smith, Claudio Zavala, Karly Moura, Scott Titmas and Lucretia Anton for tons of mic-drop Flipgrid ideas. There is no limit to the ways you can use Flipgrid in a Professional Development setting. Dive in and help all participants define their voice, share their voice, and respect the diverse voice of their peers. We are here to support you as you engage and amplify! Learning is filled with wonder and excitement and Alexandra Larson brings that same zeal to fellow educators and students daily! Alexandra is an Instructional Technology Specialist and teacher in Atlanta, Georgia who has been using Flipgrid for over two years. As a Student Voice Ambassador and Microsoft Innovative Educator Expert, she has presented ways to amplify student voice at various conferences and helped us celebrate our 1st ever FlipgridLIVE event held in Minneapolis, MN in 2017. “Versatile” is the one word Alex uses to describe Flipgrid, and through her implementation, she has shared various ways to meet the needs of learners! Flipgrid has made it easy to promote the 21st Century learning skills- communication, collaboration, critical thinking, and creativity! As I always share, it's such a versatile tool! My advice to a new user is to become part of the amazing Flipgrid PLN on social media! 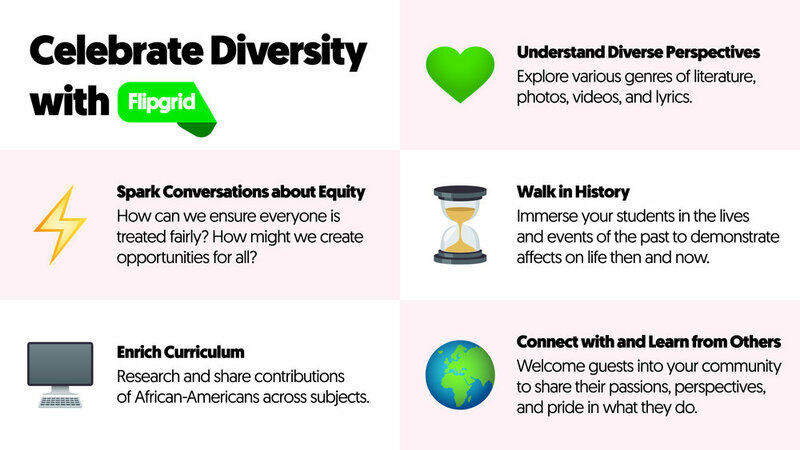 This is where you can connect with other educators, get new ideas, share your stories, ask questions, and challenge yourself to think critically- especially during the quick fire Twitter chats #FlipgridFever!